The #10 is one version of the 808 car keys micro camera. Its main distinction is the SQ907 processor and IMA ADPCM audio. Francisco reports this about setting the 808 #10 date time stamp. Put the TAG.txt file in the camera root. Disconnect the USB. Turn camera off. Turn camera on. Thanks to Sarusani in Switzerland the #10 webcam driver has been tested and verified OK.
Sarusani comments: I tested the webcam driver from your site (http://depositfiles.com/files/x30qi7vjz 3.09 MB) on Win7-64bit with my #10 (Hardware ID 0AD2 900C) and it works fine! I scanned the file with various antivirus programs and tested my OS after the installation with MS Security Essentials and Spybot S&D. No problems were found. The cam will show up as “EasyCamera” in Windows and works fine with Skype. There is no audio support! Only video will work. Video quality is very good. Vitali in Russia bought a #10 in 2011 February from buyincoins.com. He reports that this is a webcam driver executable file for the #10 camera. I have not been able to authenticate the file, so it might be malicious or contain a virus. I can't find any forum where this file is being discussed. No 808 camera seller is offering this file. I am not hosting this file. If you take the risk and it works with your #10 camera, let me know. USE AT YOUR OWN RISK WK_DVOO8_DR_V004_20101124.exe http://depositfiles.com/files/x30qi7vjz . A seller of the 808 camera sent me a #10 to review. Here are the results. This is a #10 camera. Not a very good camera. The missing frame rate, in indoor and outdoor light, is terrible. The video is far inferior to a good #3 camera. The audio does not have any annoying artifacts but the fidelity is low. The AVI data rate is about 20 to 41 megabytes per minute, about 1/2 that of a #3 camera. At this time there in no webcam driver. 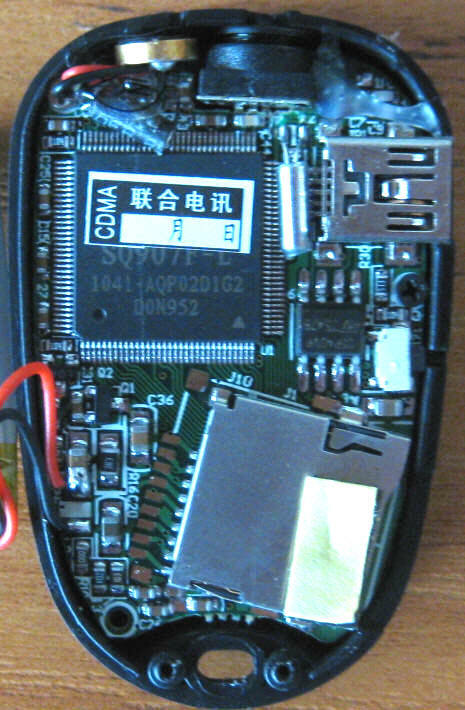 The hardware ID of the mass storage device is 0AD2 917A. When USB connected and the power button is pressed Windows wants to install a driver for "digital still camera" hardware ID 0AD2 900C. Currently there is no driver. This is probably a webcam driver that might also install a video device. Aspect ratio distorted. Circle is 6.4% too tall (1.333/1.25). Missing frame rate, indoor 45%, outdoor 44%. The AVI format is non-compliant. Virtual dub reports an error with the RIFF chunk tree past the 29th chunk. Otherwise the video plays OK.
Bad indoor color balance (yellow cast). The video looks like noise filtering is applied, giving a paint-by-number effect. Date time stamp - lower right, on transparent background, font is black border around yellow. 720x480, 30.000 FPS, 6400 to 8300 Kbps observed. Aspect ratio distorted. Circle is 12.5% too wide (1.5/1.333 = 720/640). Angle of view measured 33 degrees, 61mm equivalent. Data: distance 36", paper 11" 373px, image width 720px. Codec IMA ADPCM, 65Kbps, 16000 Hz. Eric in Germany reports he bought #10 cameras from buyincoins.com. 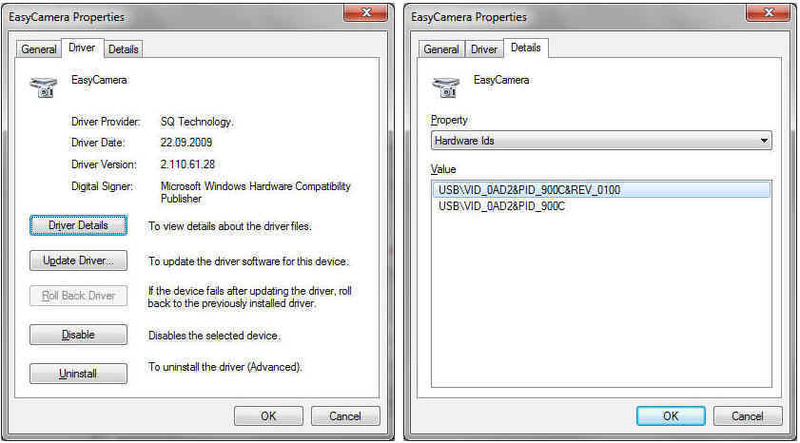 101226 - Correct the MSD hardware ID, add the webcam hardware ID. 101204 - The #10 is an interesting and different camera. 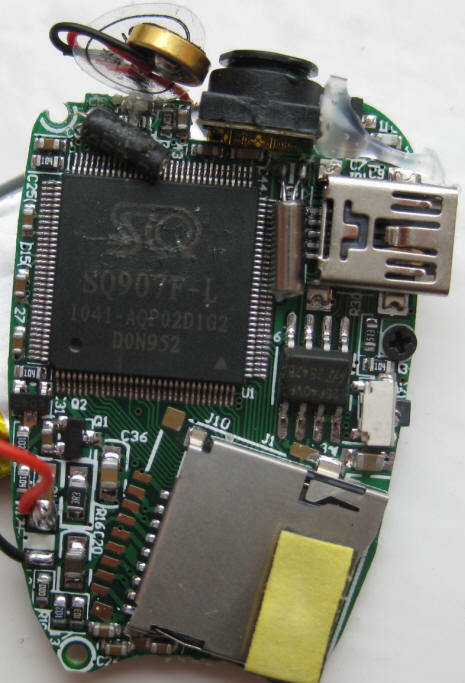 The Service & Quality Technology Co., Ltd. SQ907B (SQ907F) processor is something new in 808 cameras but has been around for years. 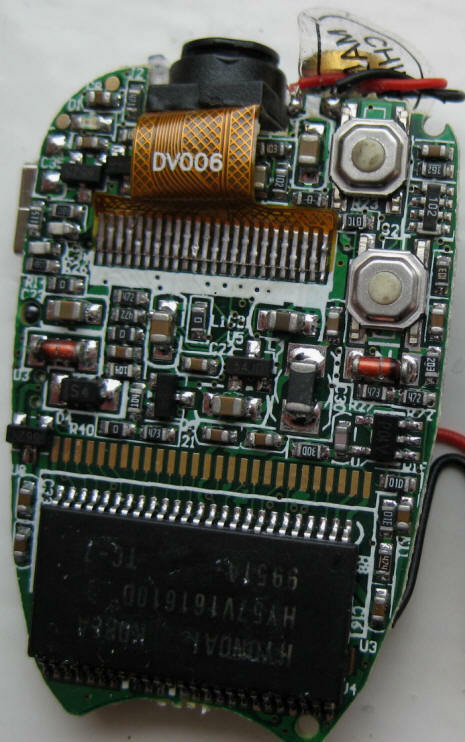 The processor was used in a Fisher Price digital camera for children in 2006. 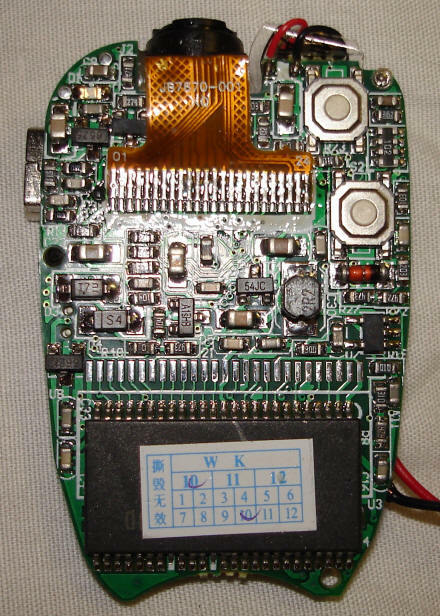 From the circuit photos it looks like the part number on the processor has been inked out. Might be a reject part. After at least 4 years in production maybe the SQ907B design is mature and being phased-out making it ideal for an 808 camera. 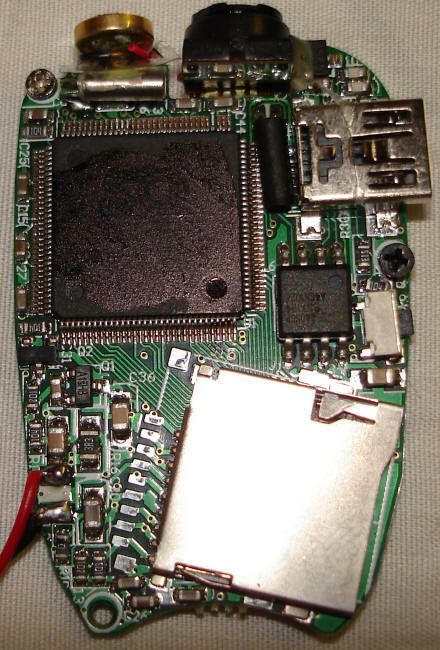 The hardware ID of the mass storage device is 917A 0AD2 0AD2 917A. The hardware ID of the webcam is 0AD2 900C. It is unknown if a webcam driver exists. 720x480 - the video resolution does not look so good at far distance. Maybe the lens is close focused. Need to see some close in (5 feet and less) video. The video looks like it has been through a noise filter which also filters out detail. The video date time stamp looks the same as a #6 camera. This is not a #6 camera. Video data rate - 12.5 Mbps is very high, about 94 MB per minute. The missing frame rate (outdoor lighting) is marginal - about 16%, about fair for an 808. 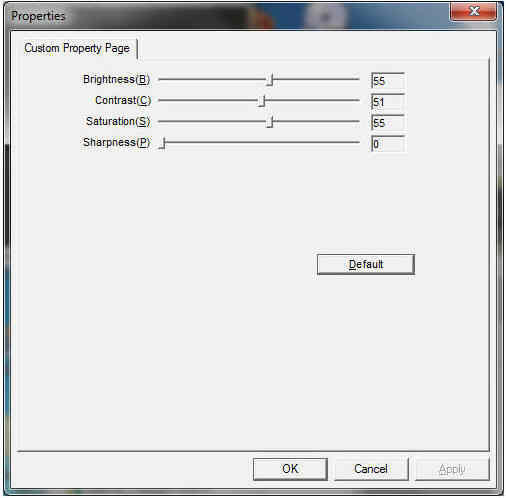 A missing frame is written to the AVI file as an exact duplicate of the last good frame. So missing frames do not make the AVI file size smaller. Most other cameras write missing frames as zero length or small length frames. Outdoor color and exposure - looks good. The audio is very strange - The audio sounds very good for a low bit rate. No strange artifacts. 64Kbps, variable bit rate, 16000 samples per second, Microsoft IMA ADPCM codec. VirtualDub warns that editing this format might cause the video and audio to get out of sync. That is my experience with variable bit rate. I don't know how many players will be able to decode this audio codec. AVI file - VirtualDub hex editor has difficulty reading the AVI file so I think it is not exactly AVI compliant. Some players might not play it correctly. The VirtualDub hex editor will only display the first 30 AVI chunks. The video has a lot of compression artifacts. The variable bit rate audio is strange, no other 808 has that. That sometimes makes editing the video much more difficult.